Body of rocking chair pad is in Nursery Rhyme Toile, with Pink Circles trim and Pink Circles ties. Slip these comfy pads on to your traditional-style rocking chair and rock the night away. Includes 2 cushions. Back cushion is 30" high by 21" wide at top, tapering to 17" wide at the bottom. Bottom cushion is 20" wide by 18" deep. Not intended for gliders. 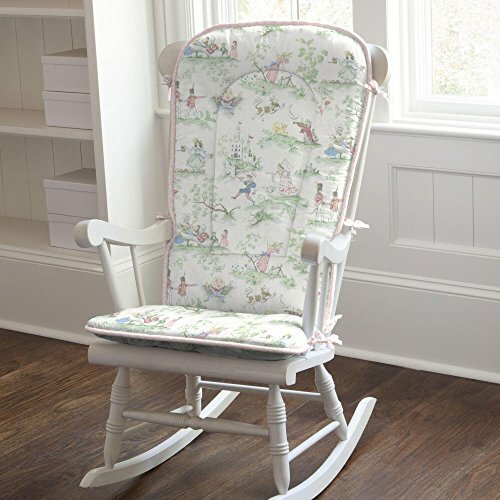 Our rocking chair batting is made from recyclable hypoallergenic polyester fiberfill. Chair not included.